Spend the weekend in a historical bed and breakfast, relax on the front porch of a beautifully restored plantation home or tour a Colonial inn for a peek into South Carolina's storied past. Experience true Southern charm and South Carolina. From the shores of the Atlantic coast to the valleys of the Blue Ridge Mountains, South Carolina's most distinctive historical inns and treasured B&Bs will make you feel right at home. Come on in; our door's always open. There's nothing quite like good old-fashioned Southern hospitality. Experience it for yourself at some of South Carolina's top bed-and-breakfasts. 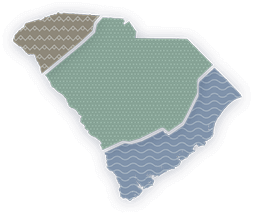 From the mountains to the sea, you'll feel right at home in the Palmetto State. Experience true southern hospitality at any one of these enchanting South Carolina bed and breakfasts. Start your day with an authentic taste of southern cooking at any one of these South Carolina bed and breakfasts. From rustic outdoor cabins in the Upstate to historic hotels along the coast, these South Carolina getaways offer an experience like no other.